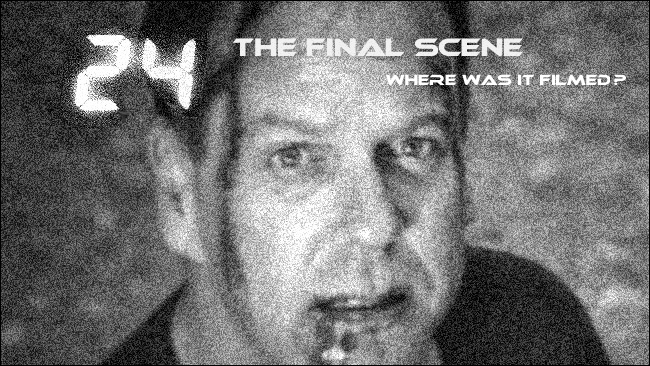 So, where did they film that final scene in the long-running show, "24"? 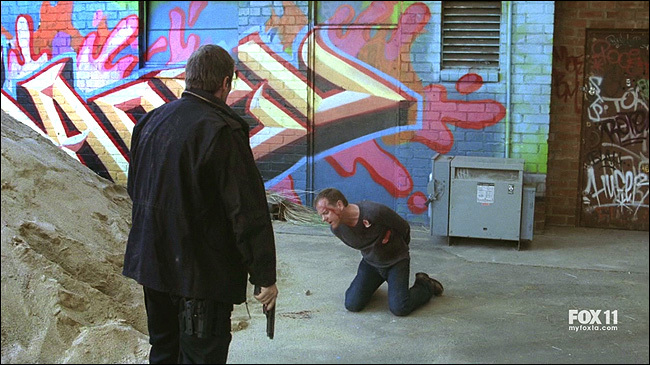 In the scene, an abducted Jack Bauer is on his knees, about to be terminated with prejudice, when the President calls in and stops the execution at the last moment. Jack, wounded and bleeding, staggers off down a New York street, pausing to look up at the CTU spy satellite watching him - to say a final goodbye to Chloe. Well, you'd be half right. 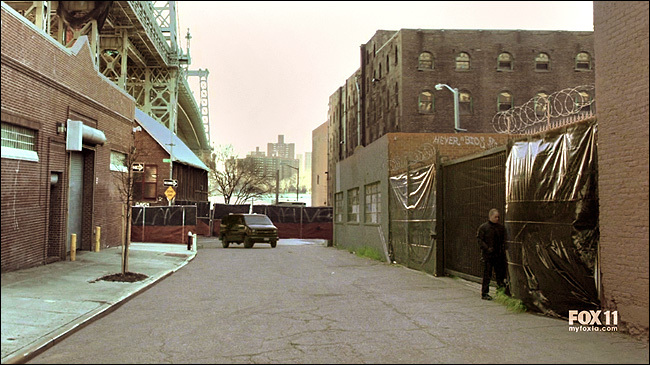 This scene was the ultimate bicoastal mashup, merging an actual New York location with an actual Los Angeles location to give us the hybrid street we saw. The bridge? That's very real. It's the Williamsburg Bridge, in NYC. It spans the East River, connecting lower Manhattan with Brooklyn. This is the east/Brooklyn end. The buildings on the left side of the street, and the street where the van first pulls up? That's also real. It's south 5th Street, to be exact, near the intersection of 5th Street & Kent Avenue, in Brooklyn. 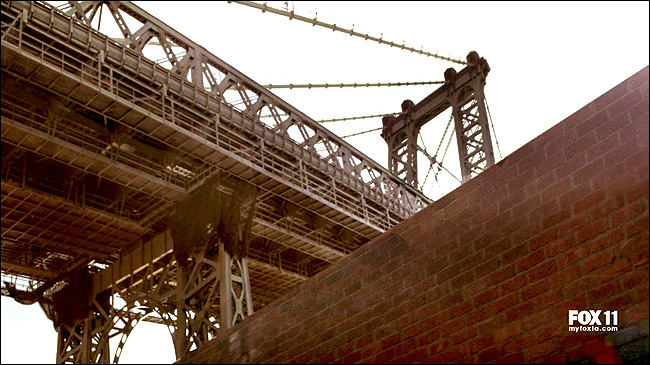 That nearby building on the left side, for instance (under the bridge) is the back of a building with the address of 17 S. 6th Street, in Brooklyn. The peak-roofed one (farther back on the left) is 352 Kent Ave., and the tall, dark building on the right side, appears to be 350 Kent Ave. But look again at those buildings on the right side. Look carefully at the low buildings closer to the camera, on the right side. Where the gate is topped with the razor wire. You guessed it. It's a fake. 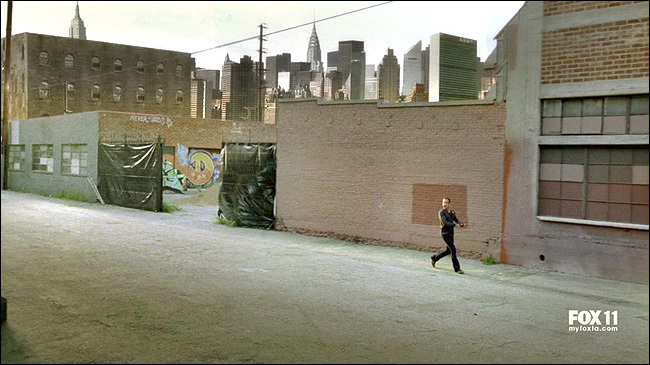 Those buildings on the right side are actually in Los Angeles, and they used CGI to blend them into that New York street scene. To be exact, those buildings can be found on the north side of Mesquit Street, just east of Santa Fe Ave, in the warehouse district of downtown Los Angeles (with the camera looking northwest). Here's a Google StreetView of the street and that gate (complete with razor wire). The scenes of Jack on his knees, about to get shot, were filmed in L.A., just inside that gate on Mesquit Street. You can even see the identical graffiti on the buildings on Google StreetView. Interestingly enough, there IS a large bridge just to the left of that Mesquit alleyway/street, but it's not (of course) the Williamsburg bridge, it's the 6th Street bridge in downtown Los Angeles. It's never actually shown in the shot. When Jack runs away (seen in the photo above), he is running east up Mesquit Street (in L.A.), as he stops and turns to look up at the satellite watching him, to say goodbye to Chloe in that final shot. Here's a matching Google StreetView. Only that old, dark, tall brick building (to the left side) is really in New York. The others are in L.A.. So, how about that New York skyline in the distance? Fake. The Manhattan skyline isn't visible from that particular point on 5th Street, and it certainly isn't visible from L.A. They inserted the N.Y. skyline later, behind the L.A. location. They blended all of this together, very convincingly, to give us the hybrid street we saw in that final shot.